This is what I did last night, when I should have been making more swap cards! This is part of the process of getting my ducks all in a row though! Lots of little things have to be done. I spent about an hour tonight on the computer getting my plain reservation, hotel info, Convention schedule, etc together. Slowly, I'm getting there! OK, to the point of the post! This bag is from Daily Window and is their Eight Days a Week bag. It's really not anything terribly fancy, but I'll be using it as a purse and carrying it through 3 airports, in & out of shuttles or taxis, to the hotel, and to the convention center. I'm not a fancy bag person anyway! It's a little bigger than what I usually use, but I'm hoping to fit most of my swaps in too. So, far, so good! It's the perfect width for cards!! Below is a close-up of the stamped part. 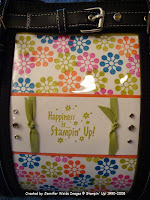 I found a stamp from a previous convention that says "Happiness is Stampin' Up!". It has fun little flowers on it that are similar to the preview set we demos got to order, Wow Flowers. So, I grabbed some colors and got stampin'! Featuring the NEW In-Colors Kiwi Kiss, Tangerine Tango & Pacific Point with Pink Passion. The liner in the bag is pretty close to the Kiwi color & my cell phone & business card holder are bright pink. Color coordination-who doesn't love that?? We also have some Rhinestone Brads that coordinate with the Kiwi, so I added some to the image, and also to the bag. See above the buckle on the handle? Green on top, then clear. And one green one also beside the horizontal buckle. I added a link to my side bar for Daily Window-so come back anytime to check out their site! Very cute bag Jennifer!! Have a great time at convention!